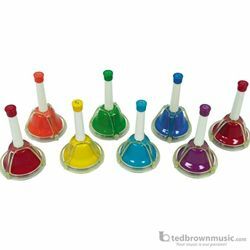 Combines the features of both handbells and Deskbells into one fun and versatile product. The special mechanism allows the bells to be played either by pushing the button or by hand ringing. The design helps reduce the "double ringing" effect. C-c Range.